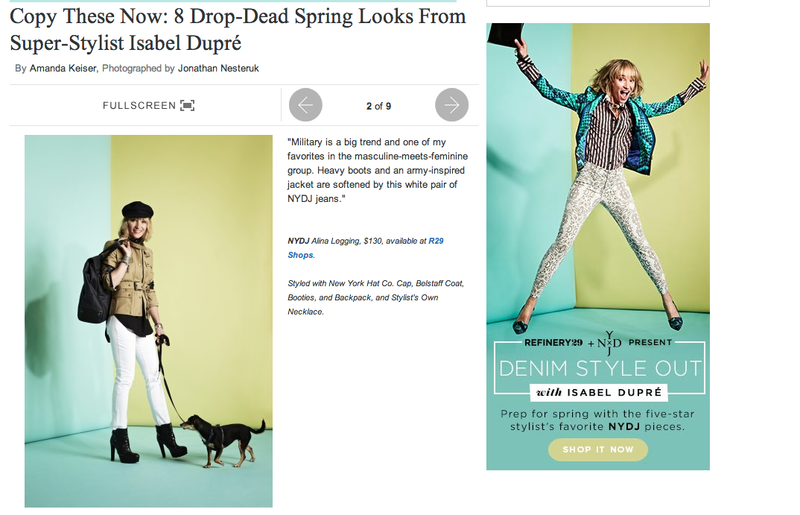 Modeling with Refinery29 for NYDJ. I was up for the challenge but took the dogs Moops and Kiki with me for moral support. They ended up in front of the camera too. Could they add some denim for my furry friends? We never have enough jeans. And they have new tops…. We used to have the “classic” photographer with a camera and tons of films, or just editors drawing on pretty notebooks. It is a little different now. Thanks to Bill Cunningham, there is still the “classic” eye but now we must add the Ipad photographer, the Iphone photographer, some people twitting or just texting,… Choose your weapon. Nothing special about it but it does bring colorful uniforms. Maybe they inspired Bruno Frisoni at Roger Vivier. Yellow and blue, nice combination. Colors, colors, it won’t go away. It’s all right with me. I found the perfect snowman and the perfect jacket. We can’t complain about a winter that feels like spring every two weeks, as long as it is cold enough to give me a reason to buy a new winter jacket, it is all good. I just got that one at Gargyle on the lower east side. It is from United Bamboo and I love it. Military is a classic, at least for me. It’s about a magician who can build whatever your crazy imagination will come up with. Sometimes, it can get a little dirty. And that’s how Andrew became a living painting. A set or an alien attack? I’ve been around for a while but I’ve never seen a balloon replacing a brush before. Sometimes, it is about doing the wrong thing. Ryoji gave Katya a cute devilish look by bringing a lot of static electricity. If you want to pull your hair back with a twist, easy… a balloon and some hairspray. It’s totally electric! We all lost it for the pink panther slippers. Sometimes Louboutin can’t compete. We had a general meltdown over something un-expected, a pair of pink stuffed animals slippers. We were shooting Julianne Moore for French Elle and we asked Sun Studio for some slippers that she could wear during hair and make up. They usually are the boring useful kind, white thing you find in hotel rooms. That’s the only thing she requested after the shoot, could I keep the pink slippers? Of course! What does a model need?